This step-by-step introduction at Wiki How, is particularly good for differentiating types of thread. The authors point you in the right direction for matching thread to projects. Did you know you should use silk thread for basting fabric? This brochure titled A Thread of Truth, is technical article about the properties and manufacture of thread. Despite the level of detail, its still quite an accessible read and is geared to the home sewer. Learn about tex size, tenacity, loop strength, color fastness, raw materials, finishes and construction. This eHow article clearly explains the differences between sew-through, shank and frog (Mandarin) buttons, as well as pronged and post snaps. http://www.sewing.org/files/guidelines/12_105_attaching_buttons.pdfThe Sewing and Craft Alliance provide an introduction for attaching both flat and shank buttons, as well as creating a shank on a flat button. I like their suggestions for "novelty" button applications, including tying the button on! I undoubtedly first bookmarked this article because of its title! It is, however, a very good introduction to using elastic. Find out whether you should be using woven, braided or knitted elastic for your next project. This fact sheet is full of useful information about measuring and sewing with this notion. 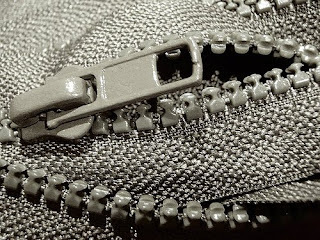 This article is text only, but is a good introduction to zippers. It details types, parts and how to make a selection. There is even a short description on how to shorten a zipper. Large manufacturer Coates, provides some great diagrams and photographs. See the differences between spiral, profile, concealed and metal zippers, as well as various types of open and closed ended fasteners. I'm loving these reference posts - have you thought about adding a page with links to these reference posts so lazy people like me can pop back over here to find the info again?? I too am loving these reference posts. I can never seem to learn enough about anything sewing/textile related! You are a wonderful, generous fountain of knowledge Liesl, thanking you again! Great post - very useful. Where's the technical information for novice mums who have to sew a white rabbit's head back onto a cheap fabric body before bedtime?? I'm adrift on the intercon with no map reference Ms HB! !